How to calculate a current ratio with our calculator? What is a good current ratio (working capital ratio)? 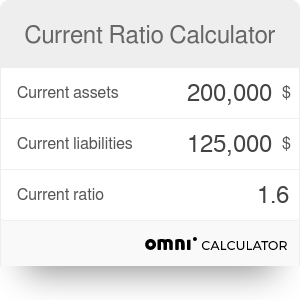 The current ratio calculator is a simple tool that allows you to calculate the value of the current ratio, which is used to measure the liquidity of a company. Note that sometimes, the current ratio is also known as the working capital ratio so don't be misled by different names! In the text below, we will explain to you what is a current ratio. What is a current ratio formula? How to calculate a current ratio? What is a good current ratio? The current ratio is one of the most popular liquidity ratios. It measures a company's ability to cover its short-term obligations (liabilities which are due within a year) with current assets. To assess this ability, the current ratio compares current total assets of a company to its current total liabilities. The current ratio is called "current" because, in contrast to other liquidity ratios, it incorporates all current assets (both liquid and illiquid) and liabilities. The simple intuition that stands behind the current ratio is that the company's ability to fulfill its obligations depends on the value of current assets. Note that the value of the current ratio is stated in numeric format, not in percentage points. You can obtain the exact values of particular factors of this equation from the company's annual report (balance sheet). First of all, you have to check the financial statement of the analyzed company. Fill the appropriate fields in our calculator and simply obtain the value of the current ratio. You can find out more about the interpretation of the calculated value in the next section of the article. The interpretation of the value of the current ratio (working capital ratio) is quite simple. It expresses the proportion of a company's current assets to its current liabilities. To give an example: a current ratio equal to 3 means that the company has 3 times more current assets than current liabilities. Very often people think that the higher the current ratio, the better. This is based on simple reasoning that a higher current ratio means the company is more solvent and can meet its obligations more easily. However, you have to know that a high value of the current ratio is not always good for investors. A disproportionately high current ratio may point out that the company uses its current assets inefficiently or doesn't use the opportunities to gain capital from external short-term financing sources. The current ratio may be confused with the quick ratio (acid ratio). Both of these indicators are applied to measure the company's liquidity, but they use different formulas. In the numerator, the current ratio takes into account all current assets while the numerator of the quick ratio considers only assets that are liquid (cash and cash equivalent, marketable securities, accounts receivable). It is worth to know that current ratio is simpler to calculate, but sometimes it is less helpful than the quick ratio because it doesn't make a distinction between the liquidity of different types of assets. If you are interested in corporate finance, you may also try our other useful calculators. Particularly interesting may be the return on equity calculator and the return on assets calculator. Current Ratio Calculator can be embedded on your website to enrich the content you wrote and make it easier for your visitors to understand your message.